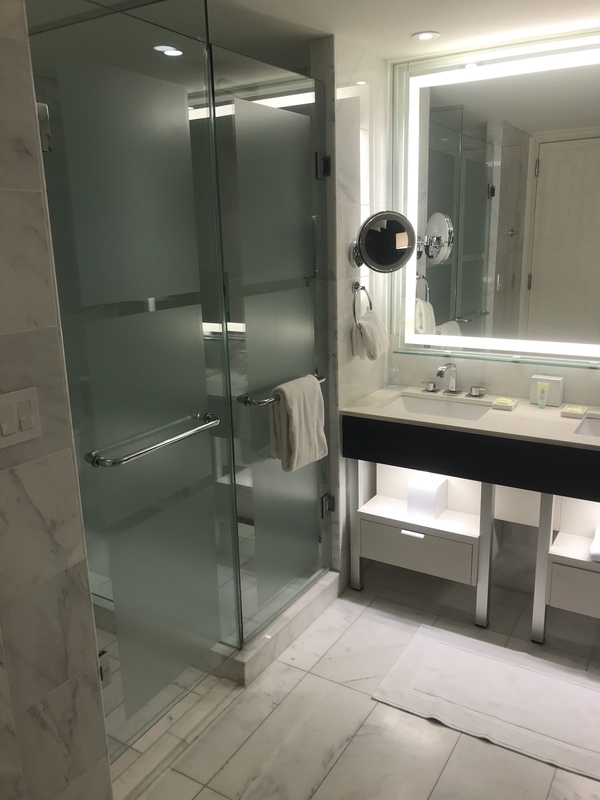 Hyatt Baha Mar Hotel Review: Does it live up to the hype? The Grand Hyatt Baha Mar is a brand-new resort in a new complex that is also home to SLS and Rosewood Properties. Baha Mar opened in 2017 and has more than 1,800 guest rooms split between two towers. 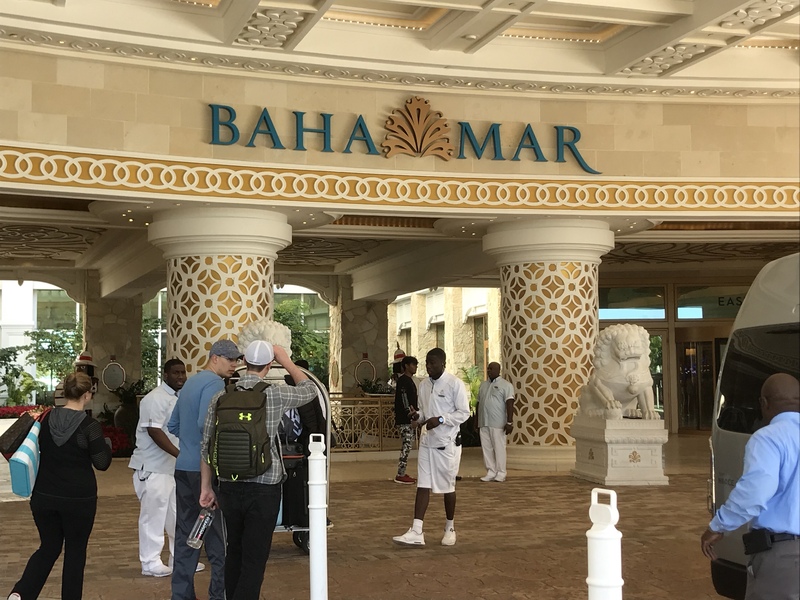 Baha Mar is home to the Caribbean’s largest casino (a title long held by Atlantis, Bahamas), a wildlife preservation sanctuary, 18 hole golf course and many other interesting attractions. My Cost: $125 + 10,000 Hyatt Points per nights + Taxes and Resort Fees of about $ 80 (here’s the breakdown from their email. The amounts in percentages will vary based on the room rate. I earned most of these points through credit card bonuses, mainly the Chase Hyatt Card, which automatically gives you Hyatt Elite status. You can see our full review of the Hyatt Card here. CLICK HERE to compare this and other Hotel Rewards Credit Cards. Cash Rate: Varies widely. The nights we were there the cash rate was about $650 because we went for New Years. It appears that the price per night fluctuates from around $200-$400. The price is comparable to Atlantis’ Royal Towers or Coral Towers. As you can see the check in area is stunning. We arrived around 10am and there was no line. There were only two people at the front desk, but they were able to take us and our friends in a separate party right away. As a Hyatt Explorist, I was hoping for a room upgrade but I wasn’t exactly banking on it since it was the day before New Year’s Eve. The employee checking me in informed me that since the hotel was full, it would be hard to give me an upgraded room but she “was going to see what she could do”. She repeatedly made mention of my Explorist status and mentioned it to other employees who stopped by the desk. In the end, I got a standard room with my choice of view, no upgrade. The front desk agent escorted to our tower on the opposite site of the resort, pointing out a bevy of shops and restaurants. This was a nice touch and we appreciated the personalized attention. As I entered the room, the first thing I noticed was the shiny marble floor, no carpet which is different than most hotel rooms. I thought it looked really sophisticated and clean. The room was about average size with a regular King bed, small desk and seating area. Overall, the room was beautiful, modern and crisp looking. I’m sure it helped that the hotel is brand new and there was absolutely no wear and tear on the room. The bathroom was very nice and had an interesting design. It has sliding doors that open fully so that you can see the rest of the room. One thing I didn’t appreciate was that the shower isn’t fully enclosed so there was a bit of splatter on the bathroom floor. All of the rooms have decent sized closets equipped with robes and Baha Mar branded flip-flops. There is also a safe, which is good to keep your valuables and extra cash for the casino. Almost everything in the room can be controlled with the tablet provided in the room. This is a nice touch that I mostly see in Las Vegas. Another nice addition to the room is a blue tooth speaker you can connect your electronics to. The coffee set-up was really nice and featured a Keurig machine with multiple types of K-cups. There is also a mini-bar that was well stocked and not that unreasonably priced. Note: If you are bringing children and need a bathtub- make sure you let them know, because not all layouts have tubs. I had the opportunity to stay in both towers because my flight was cancelled due to weather. The standard room in the East Tower was a very different layout than the other tower. We liked the look of it better. Also, the shower was much improved since it was fully enclosed. Other than decor and layout, there’s not much of a difference between the towers. As far as rooms go, Baha Mar blows Atlantis out of the water. The outdoor area has 7 different pools, each with it’s own unique vibe and layout. There is one pool that is exclusively for people who rent out cabanas, it’s small but overlooks the property and feels very exclusive. We didn’t feel the need to rent a cabana because there were only four of us and it wasn’t that busy. I can’t imagine what crazy prices they would charge for prime space cabanas. One of the main pools has both a 15 foot and nine foot cliff jump where you can dive off of rocks into the deep end. I went up to the higher one to jump off and chickened out, but the others in my party really enjoyed it and went multiple times. This seemed to be a pretty popular attraction with children of all ages (lots of adults too). A really great touch that I haven’t seen before are the individual restrooms scattered throughout the outdoor areas. The restrooms are numerous and extremely well-maintained. I would imagine they would be a huge convenience for parents with little kids since they were both private and accessible. Generally, outdoor bathrooms at beach/pool areas leave much to be desired but these were fantastic. The style and vibe of the other pools vary widely. I think there’s probably a pool to suit anyone’s taste as there are so many to choose from. While there is no designated adult pool, there are definitely some pools with an older more relaxed atmosphere. In this respect, Baha Mar does a good job of catering to many different audiences. I was surprised to see that only one of the pools has a swim-up bar. In fact, most of the pools don’t have a bar at all. Major Con: Unfortunately, Baha Mar is not immune to the age old problem of seat-saving. I don’t think it would be an exaggeration to say that by 9 AM each day there were nearly 1,000 empty seats with towels on them. I thought for sure at a resort this big with this many pools we’ll be able to find empty chairs. Nope, no where, not even at the beach. Normally at these types of resorts the pool/beach staff will walk around clearing empty chairs with towels, but they didn’t do that when we were there. The beach is absolutely beautiful and is well equipped with beach chairs and water activities. One thing I really love about the beach is that they put playground like equipment and rafts in the ocean. It’s nice to be in the water and have something to do other than swim. One way the beach experience would be improved would be to supply cushioned lounge chairs. At some luxury resorts there are plush cushions on the chairs and it really makes a difference. The service was lacking at the beach as well, but we’ll get to that later. Beach near boardwalk and food trucks. The lounge is very big and has multiple indoor and outdoor seating areas overlooking the fountains. There are multiple rooms, including a seating area with large TV’s and couches, a conference room and office area with a few desks/computers. During breakfast and dinner hours there is a full spread with a decent assortment of foods. The rest of day you can stop in for a beverage or light snack. (Operative word here is “light”, cookies and chocolates for example.) There’s a really good quality coffee machine that makes a variety of drinks like lattes and cappuccino and a variety of milk choices including soy. Also, multiple fridges stocked with juice and soda. One thing that really bothered me is that they were constantly out of plain bottled water, there was plenty of sparkling water but it seemed they couldn’t keep the little Evian bottles in stock. The next part of my review will detail the rest of the resort amenities and activities and include the rest of the resort pics. Unfortunately, service is an area where Baha Mar falls very short of the mark. There were so many instances of poor service on our 5 day trip, I had to do a two part review! Have you stayed at this property? Let me know what you though in the comments section. 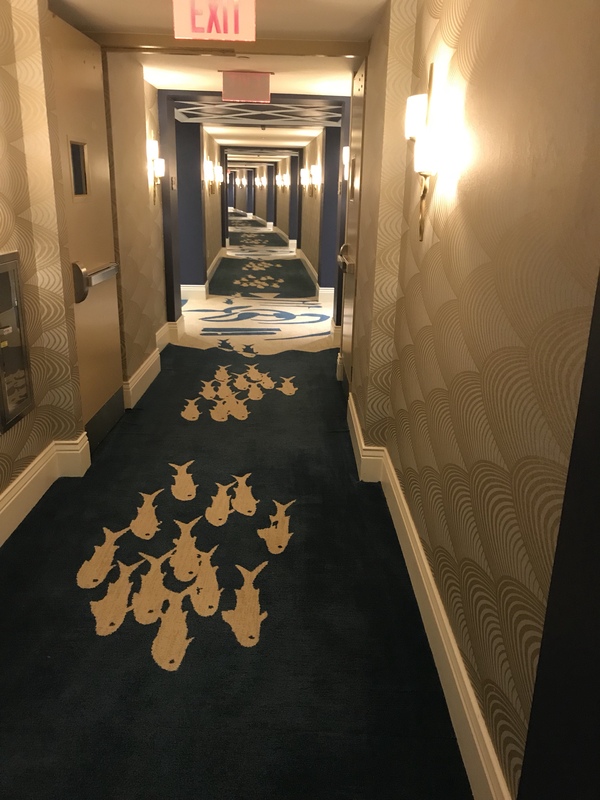 Part 1 of my extensive review of the brand new Grand Hyatt Baha Mar Resort and Casino. Includes extensive review of outdoor and indoor amenities, restaurants, casino, rooms and service. Next articleFrom Around the Web: Gift Card Reselling Warning, Get Unbanned from Boxed, Amazon Groceries at Disney & More! I’m seeing rates for about190$ over Thanksgiving… I can’t imagine it’s worth it to use points in this case. Any thoughts? Taxes and fees will drive that up to close to $275 ish – personal decision at that point. Can you please send me the information for your airport transport? Interesting read. I find Atlantis dumpy and over priced. Considering this property for 2019. Better to have used all points than points + cash and pay thenresort fee, right? How did you get lounge access with Explorist status? I did a mix, I had to transfer from chase which I don’t love- so some nights I did cash plus points and the others I did all points. It was an extra $200ish to save 10k UR points. Though if you have the Hyatt points and you don’t need to transfer- definitely go points. I used my club upgrades. How does one use their Club access Rewards? I have 4 to use but don’t know where to use them. I think the cabanas are $350 but you get a $100 F&B credit so not that bad if you have a group. $350 is what we paid for a cabana, including the $100 F&B credit. Had the cabana from 10AM to 6PM. Service was OK, but having grown up near a beach and not being a fan of the mid-day sun, we really enjoyed the ability to stay inside the cabana out of the strong rays of the mid-day sun. Prices for food were about what we would expect from a resort, not ludicrous, but not cheap. While food prices were as expected, drinks were a little pricey and we got a Bahama Mama and a Miami Vice for drinks along with food for the rest of our $100 food credit. Cabanas during peak times can get scarce so book them early in your stay. If you try to get one the day before, you may be out of luck at peak times. The first picture you had of the exclusive cabanas with the narrow pool are not available for rent. We tried. That area is just for casino high rollers. We ended up eating at the club twice a day for all of our food. Grab a big breakfast and you will make it to dinner time no sweat. On the night we were going to go to the Daiquiri Shack just off property, the food looked so good we just stayed at the lounge. The Grand Lounge had heavy hors d’oeuvres in the evening, not super fancy, but tasty enough, filling, and free (if you had access to the lounge which I did as a Globalist.) 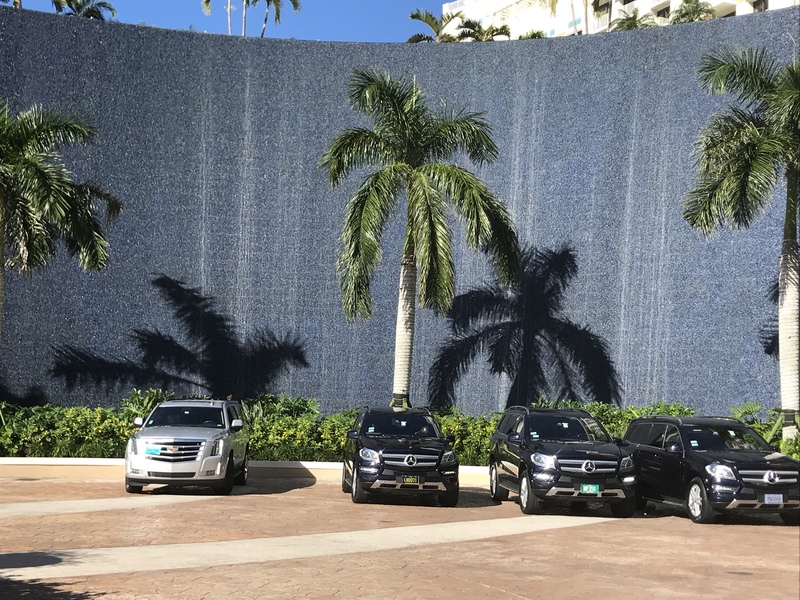 We took Mercedes transportation which we arranged at the airport at the Baha Mar counter coming out of baggage claim. It was about $45 each way. Only about $7 more than a taxi would have cost with the zone system in the Nassau. Overall we were quite pleased with our trip to the Grand Hyatt Baha Mar and would return. The resort fee (waived for Globalists) does include kayaks, stand up paddle boards, and sailboats, be sure to make use of those. First come first serve. The $105 tax on flights for leaving the island was steep compared to other places we have visited, but overall we really enjoyed this resort. I stayed and had club access. Awesome everything but the restaurant service was pathetic and terrible. No turn down service which was also not impressive and we were even staying in one of the residence rooms which have their own VIP elevator and check in. Wow! The awful Restaurant service was possibly a dealbreaker for me, although I thought the food was better than Atlantis… overall. How do you think they compare? Hi! My family of 4 is going there this coming July. Do you mind sharing info of the cab driver you used? Thanks in advance. No chairs available already?! And all of the hotels aren’t even open yet, I wonder if the grand Hyatt now has all of their rooms open. when we went in July it was a ghost town. Requesting driver information as well. Thanks. Nice review. I’d like your drivers contact information for an upcoming visit. Thanks! Bethany, thanks for review. Going this week, will appreciate driver contact information. Hi Bethany, could I get your driver’s info as well. Headed there July 15-19th with 3 kids in tow – ages 2, 4, and 6. Hopefully we can manage okay and they love it. Their favorite vacation we’ve done is Hyatt Ziva Cancun so that will be a difficult benchmark to overcome. At Baha Mar now. Correction to article, all points booking is completely free, no service charge. Globalist do get free parking on All points stays too. Airport taxi is $22 flat, 2 people. Club Lounge great, real good dinner, they actually give dinner plate and one staff called it dinner. Drinks free, no charge with 5-8:30 hours being generous for dinner. We have no need to eat elsewhere. Great value if have Club Lounge access. I think it is YMMV – my wife stayed on points a few weeks ago and was charged the $20 service fee. It was confirmed with the Hyatt twitter team that this fee is supposed to be billed on points stays and that it goes entirely to the staff. I know others have complained and had it taken off but it is a charge that you may or may not need to pay. Of course, many believe that Atlantis was an island somewhere off the coast of Greece. More still believe that Atlantis was destroyed, possibly by a volcano, which caused it to be covered by the sea. If it existed, the ship may have come from Atlantis, although that is pure supposition. If I don’t have a hyatt Globalist or whatever , how much would be the breakfast for a family of 4 ( 2 adults and 2 kids ) ? On the Hyatt website I can book with B&B rate which is $160 more per night, I was wondering if it’s worth it, or we can just order in or go out and it will be cheaper? Also, how packed is the place in July?